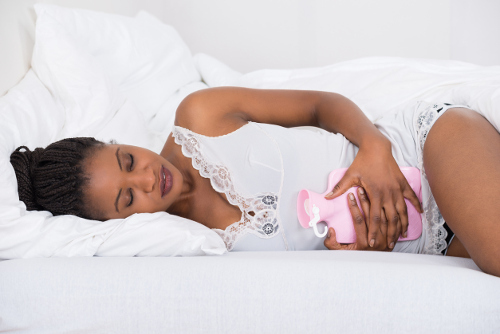 The menstrual cycle can be a simple nuisance for some women and a nightmare for others. While it is a natural process that usually follows a regular schedule and produces tolerable symptoms, it can also present an irregular pattern with debilitating results. We will learn more about menometrorrhagia, its symptoms, and possible home remedies for treatment. The medical menometrorrhagia definition is excessive and prolonged uterine bleeding occurring at frequent and irregular intervals. There are two types: menorrhagia and metrorrhagia. An average menstrual cycle begins every 28 days and typically lasts between three to five days each time. With menorrhagia, the bleeding can be heavy and lengthy, while metrorrhagia occurs in irregular bouts between the expected menstruation dates. Menometrorrhagia causes vary and can even be inherited in a few cases such as with Von Willebrand’s Disease. We will break down the common causes and their related symptoms. When estrogen hormone levels rise to a higher level than progesterone, menometrorrhagia may occur. The hormone levels may change at this time depending on one’s stress levels or with the use of contraceptive pills. This sometimes painful condition may cause a form of menometrorrhagia as tissue cells grow on the outside of the uterus rather than on the inner lining of the uterus. Menometrorrhagia can start with the appearance of these benign muscular tumors. They develop in the uterus and can appear throughout the organ in severe cases. Because this procedure entails collecting tissue samples from an enlarged uterus, it may cause bleeding. Any type of contraceptive device such as an IUD can cause the irregular bleeding seen with menometrorrhagia. An irregular and/or lengthy pattern of bleeding is just one of the many effects of carrying excessive weight. Since menometrorrhagia is basically a menstrual hemorrhage, some of the symptoms may mimic those experienced with regular menstruation. The extent of the bleeding and how long it lasts are key indicators for a medical diagnosis. With a physical examination, doctors may take samples directly from the uterus to ensure there are no cancerous growths. Blood samples will determine hormone levels as well. Menometrorrhagia treatment methods vary, and there are both medical and non-traditional home remedies that may treat the condition. Pain relievers such as non-steroidal anti-inflammatory drugs (NSAIDs) work to slow and decrease the amount of blood flow. For cases of excessive blood loss, a blood transfusion may be a necessary part of treatment. For more serious cases, there are surgical procedures such as a hysterectomy or endometrial ablation to help alleviate symptoms and treat the bleeding. Try using some of the following remedies for more natural treatments. This remedy reportedly reduces the blood flow as it increases the levels of progesterone. Cook a handful of banana flowers and add curd before eating. These may be excellent for curbing extreme symptoms of menometrorrhagia when ingested two to three days before the expected start of menstrual cycle. Mix seeds in a glass of milk and drink. You could also alleviate symptoms by taking these seeds during the menstrual cycle. Boil seeds and drink solution once cooled. To help control the menometrorrhagia symptoms, the leaves of pomegranates and seven rice grains may be effective. Mix to create a paste and ingest twice each day for a month. Boil parsley leaves in water for a drink to have during the first three days of the menstrual cycle. Take three glasses each day to treat some of the symptoms. Menometrorrhagia affects nearly one-quarter of women between 14 and 45 years of age. This condition can present symptoms similar to regular menstrual cycles but at a heightened level. Causes range from genetics to hormone balance and underlying health conditions. It can lead to pain and embarrassment for some as the ailment can last for very long periods of time. Mild cases may be treated with simple home remedies while more serious cases may involve blood transfusions or surgery. “What Is Menometrorrhagia & How Is It Treated?” ePain Assist; https://www.epainassist.com/pelvic-pain/uterus/what-is-menometrorrhagia-and-how-is-it-treated, last accessed May 15, 2017. “Menometrorrhagia,” MDDK Online Medical Doctor; http://mddk.com/menometrorrhagia.html, last accessed May 15, 2017.